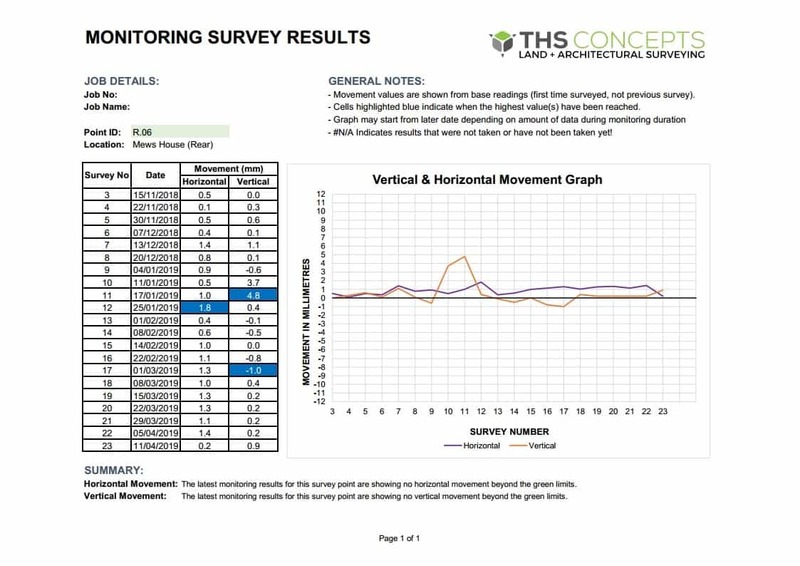 THS Concepts provides easy to understand movement data for structures that are undertaking or near to construction works such as basements, extensions, underpinning etc. 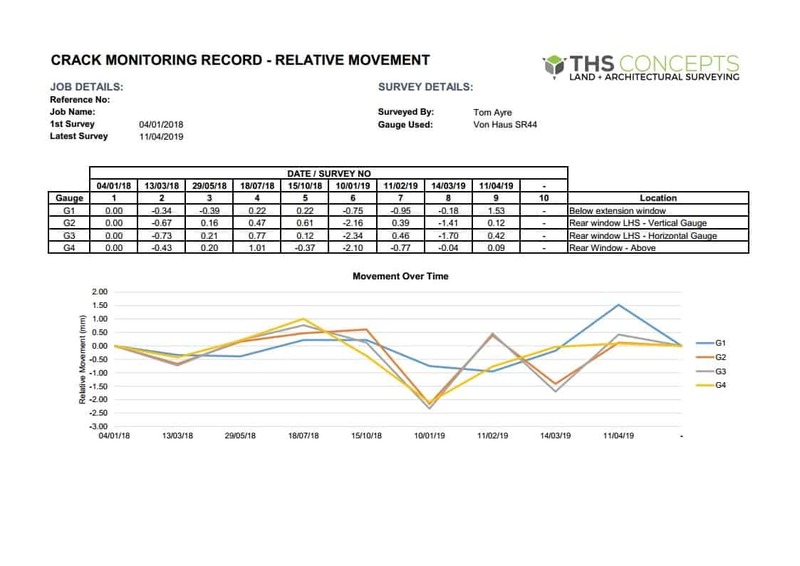 Used by party wall surveyors and contractors across London and the South East, we provide easy to understand monitoring reports to record structural movement over time. We put your mind at rest during your building works by undertaking detailed monitoring surveys and producing clear, easy to read reports that help demonstrate movement, or the lack of, during a building project. Our monitoring service is typically utilised during projects where underpinning, basement excavation, and party wall works are taking place. The monitoring reports reports help you satisfy key requirements and agreements with neighbouring property owners. During major structural works we recommend speaking to your project manager about monitoring intervals. Usually during heavy works the monitoring surveys are undertaken on a weekly basis and then moving to a monthly basis when the less intrusive works are taking place. 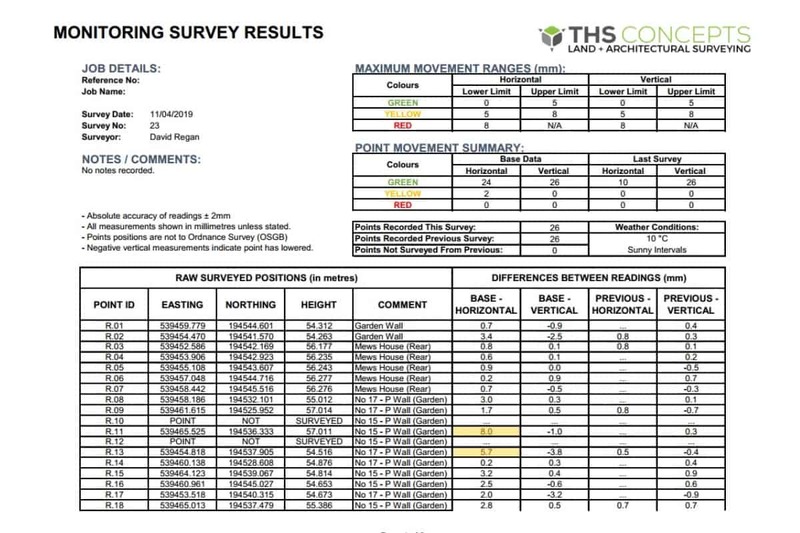 Prior to arriving on site we always issue our clients with a free monitoring proposal document outlining things such as where we are putting targets, what equipment we will be using and the movement trigger levels. This document is helpful it clearly outlines the process and details for those who may not understand the monitoring survey process. On our first site visit we will install the targets that we will be monitoring. These are usually white 25 x 25 mm sticky backed targets that are either mounted to the wall directly or secured on to metal brackets with adhesive. For targets that aren’t on ground level we usually ask our clients to arrange access with ladders or access platforms however this is something we can arrange ourselves. Once we have installed the targets we then return at set intervals to survey in and monitor the targets. Using a Leica total station we can record the vertical and horizontal movement to within 1mm. Following this we then issue a detailed, easy to understand report illustrating the movement. We can also issue graphs illustrating the movement over time on each point. Our professional service provides you with peace of mind with our £5,000,000 professional liability insurance and £5,000,000 public liability insurance. We also offer a 100% money back guarantee on all of our work if you are not happy with the result! We’re also happy to provide health and safety documents if required. Your reports show horizontal and vertical movements over time in a clear, easy to read manner. We typically return all monitoring survey reports within 1 day of the survey. If we notice any major movements whilst on site then these will be flagged to the relevant site team member. Our Google & TrustPilot reviews demonstrate the level of customer service we provide both before and after a project has finished. Our experienced monitoring survey team have undertaken a number of different projects ranging in size from small underpinning to jobs to large 3-storey basement excavations. Our surveys are undertaken using precise Leica equipment. You can trust that your design proposals will work with the space you have. Small or large, get in touch today to discuss your monitoring project and we can get back to you with a quote and a proposed start date.